Recently, you might be often hearing articles about autonomous driving technology through various media such as TV news, online contents and newspapers. Cube Intelligence is also applying its vision and deep-learning technologies to autonomous driving research and development. The technology that Cube Intelligence concentrates on is the development of autonomous valet parking (AVP) for self-driving cars. Cube is developing a technology to park cars into empty spaces unmanned even in the underground parking lots where GPS cannot reach, and have applied for related patents. Recently, the interest of many related companies is focused on the technology of Cube. What is the current state of technology development and market trend of autonomous vehicles? According to experts' analysis, automobile ownership ratio will decrease by 90% and taxi-related industry will increase by 3~4 times by 2030 as autonomous vehicle supply increases. Ninety percent of the parking lots currently in use will be converted to other uses. As the next generation of mobility technologies and innovations are progressing globally, Korean government and numerous companies are also working to commercialize autonomous vehicles. Recently, the government has established and expanded the K-City Autonomous Driving Vehicle Test Station so that autonomous driving technology can grow even more. It is said that 60 fleets of total autonomous vehicles in Korea are currently under test for 716,449 km. 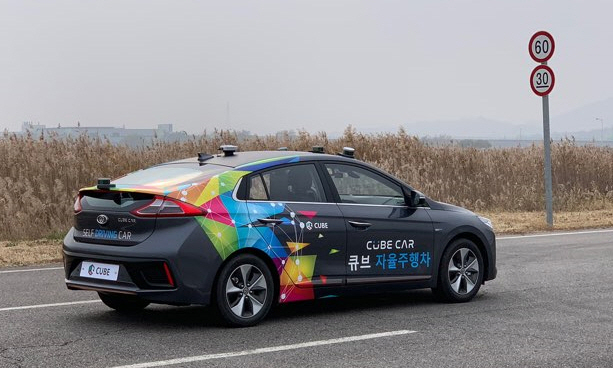 In January 2019, Cube Intelligence’s self-developed autonomous vehicle got approval from the Ministry of Land, Infrastructure and Transport to operate test drive a self-driving car. Currently, Cube Intelligence is in the process of researching and developing advanced technology in the autonomous mobile market. We are developing better vision skills through AI based test driving so please support the growth of Cube in the future. 최근 TV 뉴스와 신문 등 여러 매체를 통해서 자율주행차 기술에 대한 기사를 자주 접하고 계실 텐데요. 큐브 인텔리전스에서도 비전 기술과 딥러닝 기법을 이용해 자율주행에 적용하고 있죠. 큐브가 집중하고 있는 분야 중 하나는 바로 자율주행차 발렛파킹 시스템(AVP; Autonomous ValetParking)인데요. GPS가 도달하지 못하는 지하주차장에서도 자율주행차가 무인으로 주차할 수 있는 기술을 개발 중에 있으며 관련 특허를 출원한 상태죠. 최근 이러한 큐브의 기술에 많은 관계사들의 관심이 집중되고 있는데요. 현재 자율주행차의 기술 개발 현황과 시장의 흐름은 어떤 상황일까요? 관련 분석가들의 분석에 의하면 자율주행차 공급이 늘어나면서 2030년까지 자가용 보유율은 90%감소하고 택시 관련 산업은 3~4배 정도 증가할 것으로 예측되고 있는데요. 현재 사용되고 있는 주차장의 90%도 다른 용도로 전환되게 될 예정이며, 전 세계적으로 차세대 모빌리티 기술과 혁신이 급속히 진행되고 있는 가운데 한국의 정부와 여러 기업에서도 자율주행차 상용화를 위해 노력 중입니다. 최근 정부에서는 자율주행 기술이 더욱 성장할 수 있도록 K-City 자율주행차 시험장을 설립, 확대 운영하고 있는데요. 현재 한국에서는 총 자율주행차 60대가 716,449km 시험운행 중이라고 하네요. 2019년 1월 큐브에서도 자체 개발한 자율주행차가 국토교통부로부터 '자율주행자동차 임시운행허가'를 획득해 자율주행차 무인 주차 기술 개발에 탄력을 받게 됐죠. 현재 자율주행 시장에서 앞서가는 기술을 확보하고 연구 개발 중인 큐브 인텔리전스. 시험주행을 통해 더 나은 비전 기술을 발전시키고 있는 가운데, 앞으로 큐브의 성장을 함께 응원해주세요.